In 1950, Sony launched Japan's first G-type tape recorder and "Soni-Tape" magnetic tape. Shortly after, the use of reel-to-reel tape recorders proliferated from government offices to schools, broadcast stations and private homes. In the 1950s, stereophonic sound and transistor technology were developed and commercialized. Norio Ohga, section manager of the Tape Recorder Division, began the push to make reel-to-reel tape recorders easier to use in the 1960s. In 1964, the TC-357, known as the "SONY-O-MATIC Seven," was fitted with a fully automatic recording level control function. The TC-357 afforded simple and automatic operation thanks to its escalate drive mechanism. At the same time, however, Ohga began to think that the reel-to-reel system had limitations. Looking further ahead, the 1958 launch of tape cartridges by RCA spurred companies worldwide into developing tape cartridges, cassettes and "magazine tapes" under various names and based on different standards. The common feature of these products was, unlike manually threaded reel-to-reel systems, simply inserting the encased tape into a tape player and pressing a button could operate the new systems. People without technical backgrounds could operate it very easily. Naturally, the machine itself could also be miniaturized. While Sony had launched the "Baby-corder," a reel-to-reel "magazine-type" machine in 1957, and had taken the initiative in developing cassette tapes as well as other smaller, lighter products, these items had not achieved wide market penetration. Sony tape products at this time were called "magazine-type tapes." Ohga declared, "We want to create a worldwide standard for encased magnetic tape products and make easy to use tape recorders available to everyone." This became the increasing focus of his day-to-day activities. Although Sony was in the advantageous position of being Japan's leading tape recorder manufacturer, independently developing a worldwide standard was a difficult prospect. Ohga felt that cooperation with partners was necessary. One day in September 1963, at the opening of the Berlin IFA Exhibition, Fredrich Lachner of the German company Grundig proposed to Ohga that the two companies cooperate in developing a DC International Standard for cassette tapes, a standard conceived by three German manufacturers. While Ohga considered this possibility, another proposal came from Wisse Dekker, manager of the Philips Electronics Far East Division and later president, and L.F. Ottens, a technical expert also from Philips. They came to Japan and proposed the co-development of the compact cassette to Ohga. Philips had already developed a compact cassette in 1963. The advantages of both the Grundig and Philips formats were weighed and considered. In the end, Ohga chose the Philips compact cassette because of its smaller size. However, a problem over royalties arose during the contract stage. Philips initially suggested that it receive a payment of 25 yen for each unit sold by companies in Japan. Ohga thought this was excessive and did not agree to it. A few days later, Philips showed some flexibility and asked for 6 yen per unit, a figure it said other companies had agreed to. Masanobu Tada, Operations Division manager, recommended that Sony accept the offer, but Ohga still refused, insisting that unless Philips waived royalties altogether, Sony would collaborate with Grundig. Finally, Philips agreed to waive royalties, but did not give Sony exclusive rights to the technology. In 1965, based on a patent that guaranteed compatibility, Philips made the technology available free of charge to manufacturers all over the world. One year earlier, the start of Shinkansen services between Tokyo and Osaka and the Tokyo Olympics had demonstrated the extent of Japan's postwar recovery to a surprised world. Thereafter, the newly standardized compact cassette format gained popularity. From 1966, Sony and other Japanese manufacturers began mass production of cassette tapes and tape recorders in response to growing demand. In 1966, Sony launched the TC-100 "Magazine-matic" cassette tape recorder, based on the compact cassette standard. Weighing only 1.75 kilograms, the cassette recorder was less than half the weight of the lightest reel-to-reel tape recorder, while taking up less than half the space. At first, cassette tape recorders could not match the sound quality of reel-to-reel recorders and were mainly used as study aids and for general-purpose recording. However, technology was soon developed that allowed high quality recording and playback of music. Radio cassette tape recorders and other such products were launched, and the compact cassette tape became a widely used medium for the listening of music. In 1965, when reel-to-reel systems still dominated the market, Japan's magnetic tape manufacturing industry was worth around 3.5 billion yen a year and exports were minimal. By 1969, with the introduction of the compact cassette and its establishment as a music medium, the magnetic tape market was worth more than 10 billion yen. By 1981, the combined annual production value of Japanese audio tape manufacturers was 130 billion yen, just over half of which was exported to markets abroad. 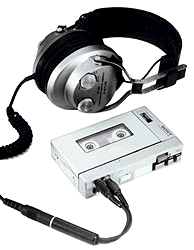 The compact cassette developed into a successful worldwide standard, living up to the expectations of Philips and Ohga. However, while regarding Ohga as a crucial partner in the success, Philips viewed him as someone who had caused them to lose a potential fortune in royalties. As the 1970s drew to a close, a new development emerged that was to further boost the success of the audio cassette. By the end of the 1970s, stereo cassette tape machines were a cherished fixture in many homes and automobiles. However, truly portable units with built-in speakers or for use with headphones were limited to monaural sound. In 1978, Sony added the small TC-D5 stereo model to its well-known Densuke series of portable tape recorders. Although popular among audiophiles, the TC-D5 was too heavy to be truly portable and the cost was prohibitive at 100,000 yen. Ibuka (then Honorary Chairman) was a regular user of the TC-D5, and he would take one with a set of headphones on overseas trips, so that he could listen to music in stereo on the plane. However, he found it too heavy. One day, before going on a trip to the United States, he asked Ohga (then Executive Deputy President) for a simple, playback-only stereo version of the "Pressman," the small, monaural tape recorder that Sony had launched in 1978. Ohga immediately called Kozo Ohsone, general manager of the Tape Recorder Business Division. Ohsone immediately replied, "Yes, yes, I'll do it." He had his staff alter a Pressman, removing the record function and converting the machine to produce stereo sound. They then attached headphones and tried this creation. The resulting sound was actually quite good. Shortly after, Ohsone and his staff were working on this rather strange-looking combination of large headphones and a small Pressman, when Ibuka visited them to discover if they had created what he requested. Always interested in products under development, Ibuka had a habit of dropping in at Sony's various laboratories. Ohsone suggested that Ibuka try the modified Pressman. Ibuka was pleasantly surprised by the powerful sound that came from such a small device, and he was reminded of the first time he had listened to stereo sound through binaural headphones at the 1952 Audio Fair in the United States. Ohsone managed to provide a modified version of the Pressman in time for Ibuka's business trip, but it worked with small, special batteries. Ohga presented Ibuka with the unit, together with two batteries that he had an engineer from Ohsone's group rush around Akihabara (an electronics-shopping district in Tokyo) to find and a selection of classical music tapes. Ohga's relief was short-lived. He received a call from Ibuka in the U.S., who said, "The batteries ran out on the plane, and I can't find any replacements over here." Ohga also realized that the tapes he gave Ibuka were blank, and he hurriedly called CBS Records in the U.S. to ask them to prepare a selection of music tapes for Ibuka. Despite all this, when Ibuka returned from the U.S. he was obviously pleased with the unit, even if it had large headphones and lacked a record function. Ibuka went to Morita (then Chairman) and said, "Try this. Don't you think a stereo cassette player that you can listen to while walking around is a good idea?" Morita took it home to try over the weekend, and he was also impressed. He agreed with Ibuka that the sound was quite different compared to conventional speakers, and he was excited by the fact that the device could be carried around easily, creating a personal listening experience. Morita's business acumen alerted him to the great potential of this new item. "In February 1979, Morita called a meeting at Sony Headquarters. The group of predominantly young, electrical and mechanical design engineers, planners and publicity people were more than a little apprehensive, as well as curious, to hear why they had been summoned by the Chairman. Morita held up the modified Pressman and said, "This is the product that will satisfy those young people who want to listen to music all day. They'll take it everywhere with them, and they won't care about record functions. If we put a playback-only headphone stereo like this on the market, it'll be a hit." He continued by saying, "Our target market is students and other young people. We must launch it before the summer vacation at a price similar to the Pressman, which means less than 40,000 yen." At that time, for sales and accounting purposes, new product launches usually took place on the 21st of the month. To meet Morita's deadline meant launching the product on June 21, which was only four months away. To develop the necessary manufacturing, marketing, and other systems in such a short time was a formidable task. Most of those present were stunned. "We can't do it in such a short time," was the general consensus. However, they were excited about the idea. It was a product they themselves wanted to develop and use and they agreed that a launch before students started their summer vacation would be ideal. Thus, the collective conclusion reached was "It's difficult, but not impossible. Let's give it our best shot." With regard to price, everyone involved with the project thought that instead of working out a price based on production costs, they must first decide on the price at which the product would sell. They believed that if the price could be kept below 30,000 yen, sales would be great, but that 35,000 yen was more realistic from a cost point of view. At this point, Morita said, "This is Sony's 33rd year in business, so let's sell it for 33,000 yen." Under Morita's leadership, they decided on a strategy and resolved to launch the product before the summer vacation. Morita was completely absorbed in the new business. While Ibuka was adept at spotting new and interesting technologies and motivating his staff to develop them, Morita was the one who had the vision required to turn technologies into products. Since the founding of Sony, the two men had combined these different, but complementary, talents to great effect. Morita said to Ibuka, "This product is going to enable young people to listen to music anytime, anywhere. But the headphones are bigger than the device itself. Can't we do something about that?" On hearing that, Ibuka remembered an R&D meeting two or three months earlier, at which there was talk of developing lightweight, open-air type headphones. Sure enough, when he went to the Research Laboratory, he found exactly what he was looking for. The development of the compact and extremely lightweight H-AIR "MDR3" headphones was virtually finished. While most conventional headphones at that time weighed between 300 to 400 grams, the H-AIR headphones weighed just 50 grams. Furthermore, the new headphone driver units that fitted over the listeners' ears were only 23 millimeters across, much smaller than the 56-58 millimeters that was normal for the oval-shaped, earmuff type headphones developed previously. Despite being so small and light weight, the headphones produced great sound. 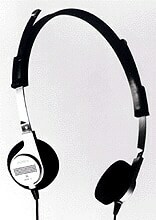 The H-AIR headphones were included in the portable stereo project in March 1979. Between them, Morita and Ibuka had successfully brought together technologies developed independently by different sections of Sony.